I was firmly believing that this Windows Vista is almost uncrackable but time proved it wrong. As old saying goes on and on "nobody is perfect". That nobody is 'Microsoft'. I bought it in local market and tried to install it on my old spare system. It took few hours and it got installed. Though interface wasn't good enough. I once read, that this Vista has adaptability to suit itself with the minimum bare requirements compromising all the graphical charms it enjoys in powerful system. I'm not yet in a mood to review Vista but yes, there is cracked VISTA which i got in MahaBoudha and it worked. I came to home and started searching on cracked Vista. And, the result confirmed it's fully working copy of VISTA. I was wrong about the post i made earlier(Windows Keygen Hoax). Microsoft really should start initiating steps towards this. 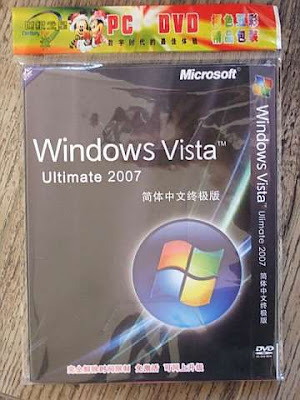 From the source that reads,"
This is not the first time we've mentioned a Windows Vista crack, and it won't be the last, but now a hacker group known as NoPE somehow managed to create a cracked Windows Vista DVD that works immediately, out of the box, with no serial number or activation keys required. Just like some of those corporate versions of Windows XP that worked for years, the hacked Vista product appears to be already activated and it even automatically updates itself with the latest patches. The cat and mouse game continues, where Microsoft will counter this, and then the hackers will respond, and so on, and so on. Of course, activation schemes, digital rights management and security measures only affect the honest people, inconveniencing them and sometimes even stopping them in their tracks, while the h4ck3rz rise to the challenge every time with their formidable sk1llz. Sigh. – Charlie White "
OMG! I love Window Vista! It's sooo cool and kind of "aftyaro" to use at beginning, but quite nice afterwards. Prerana, wow, that's very good..
yeah, instead of strict cyber law policy, most of warez sites are forwarded towards chinese servers which let us download full Operating system at ease. These chinese/russians/and some part of asia like vietnams are at the top list of piracy. It's just rare to imagine that people would buy genuine product in these region. Speed has provided the stat few weeks ago regarding this too. so, No doubt. That happens.